This bird is well named, for he has a coat of the purest, richest, and most gorgeous blue on back, wings, and tail. There is no North American bird that better deserves the name. There is no other that flashes before our eyes so much brilliant blue. It has been said that he carries on his back the blue of heaven and the rich brown of the freshly turned earth on his breast. 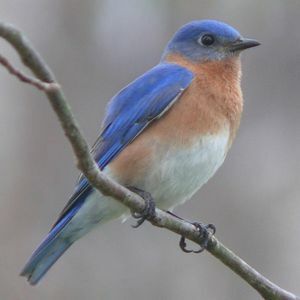 These birds are seen more or less in winter over so much of their breeding range that the spring migration is not easily traced. Probably there is a gradual northward trend throughout all the winter range, with periodical retreats and advances influenced by weather changes. This bird may lay anywhere from three to seven eggs to a set. It is a persistent egg layer. If a set of eggs is taken, another will be laid within a very short time.